Samsung will introduce its new and improved Smart Control next week at CES in Las Vegas providing four different ways to interact with your TV. The successor to last year's model has added two significant features providing users with more accurate content selection and ultra responsive control. The new gesture-recognition allows you browse through the menus by literally moving the remote. The 2014 model also keeps its Voice Interaction feature so you can search desired content by speaking into the remote's microphone. It conveniently recognises natural language instead of having to reel off a list of key words and phrases. The touchpad, which was on last year's model, is now 80 per cent smaller so you can easily swipe your thumb when gripping the remote. 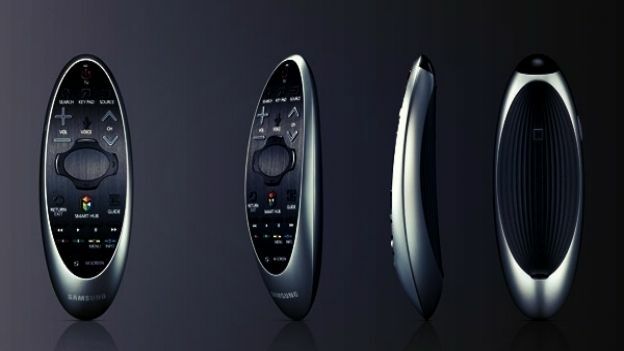 Samsung has also notably given their Smart Control a flashy new look evolving it to a more ergonomic oval shape that's designed to fit more comfortably in your hand. If you want to know what to expect at CES next week, check out our 2014 CES guide.